← Your EVP – Do you have one? How many applicants does it take to find one qualified candidate? How many does it take to find the right one? Have you seen Ira Wolfe’s blog How many job applicants does it take to find one qualified candidate? “The “war for talent” is heating up even in the midst of high unemployment. According to an article last week in the Wall Street Journal, it takes many more than most employers think (or at least want to accept.) I repeat – a lot more. The actual numbers are numbing. Does your HR team have the time for this? What new processes are you using to manage this? It is enough? What are outside recruiters doing to manage it? At Hampton & Associates, we narrow the field before we begin inviting people to consider the role. We hunt instead of fishing. Drop me a note if you need some help narrowing down the field! 3 responses to How many applicants does it take to find one qualified candidate? If you get the sourcing strategy right, the people viewing the posting are more likely to apply themselves or refer the right person. I follow this strategy for each assignment we work on and our tipping point is 150. I totally agree, Regina. Our tipping point is about the same, depending on the search – for some of our searches there really are only 50 people who have all that it takes to do the job, for others 200-500. This is why we offer both hourly and project based pricing and involve the client in the decision of how many people to contact after we have identified the pool. 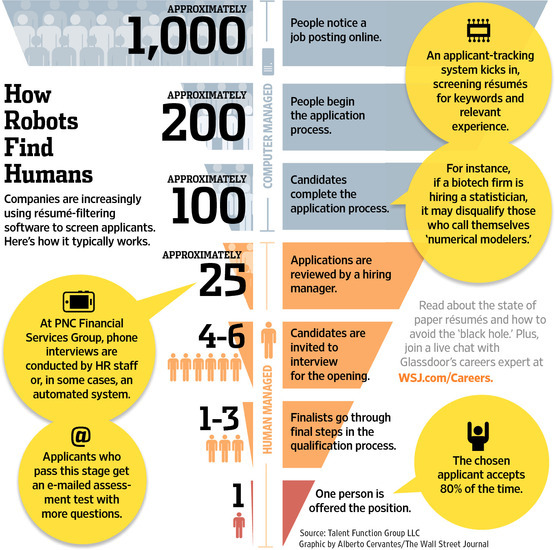 I was surprised by the infographic – mostly because I don’t use the “post, wait and sort” method of finding the right people.